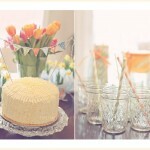 Just some pretties from a baby shower I hosted on February 26th! I realize the cake buntings are buntings in general have taken over the design and photography world but I just couldn’t help myself. I used some left over material from the banner shoot here. Happy Tuesday!